Check out this neat nightlight your kids are going to adore. The stylish Glo light not only changes colour but has removable glowing balls that kids can safely pluck out and use to light their way to the bathroom at night. It’s another winner from those innovative designers at Boon, a nightlight with serious interactive cool factor. 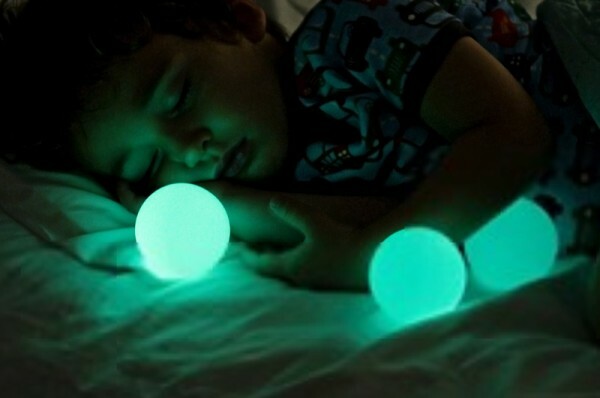 The Glo balls contain no electronic parts so are completely safe for little hands to hold, whether playing in bed or lighting their way through a dark house in the middle of the night. They are made from the same style of phosphorescent material used for those stick-on ceiling stars. The light from the lamp charges the balls so that when they are removed they hold their soft coloured glow for about thirty minutes, helping little souls to snooze off. Plus as an added bonus Boon claim they are 95 per cent effective at keeping monsters away all night long too! The Glo pedestal is made with kids safety in mind as well. Made from BPS free plastic, it won’t get hot because the lights are colour changing LEDs which remain cool to the touch. The lamp can be set to one colour or to gently colour change. Available from Amazon for $62.